It is important to have as much green vegetables in your diet as you can. They bring you tons of good, including chlorophyll, the oxygen for your cells. 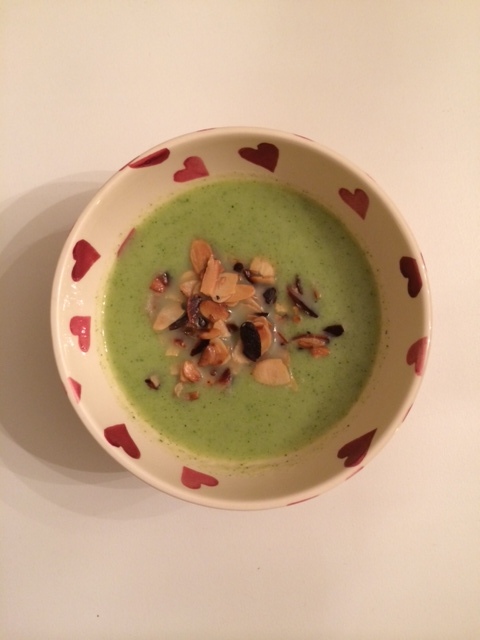 I sprinkle the soup with some roasted almonds, not only does this bring a lovely twist to the soup, but almonds bring you good fats and have many other health benefits, which you can read about it here. This soup is easy to make as it involves very little work to prepare the vegetables and roasting the almonds takes only a couple of minutes. Peel the zucchinis and cut them in big chunks. Cut the heads of the broccoli and wash them. Put them to cook in water with the zucchinis. Cook the vegetables on low to medium heat it for about 20 min or until they are tender. Pass the vegetables to the mixer and add some water from the cooking to adjust the consistency to your taste. Heat a pan on medium heat with some fat (I used coconut oil). When the fat is warm, put the almonds in the pan and roast them for a couple of minutes until some of them have a beautiful and rich dark brown colour. 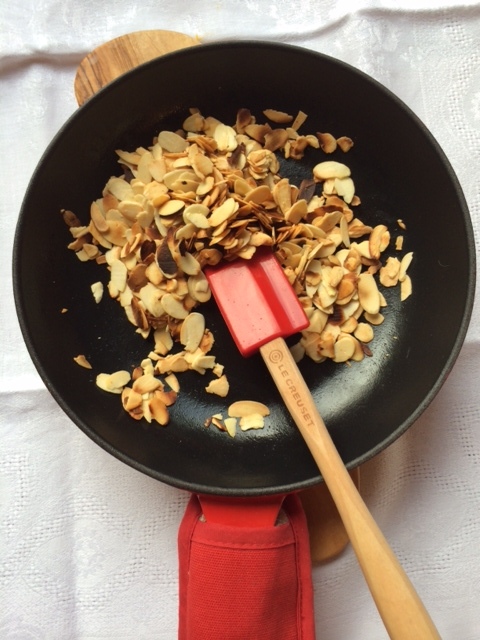 Sprinkle some roasted almonds on the soup before serving and enjoying. That sounds so good. I love soup but it wouldn’t occur to me to add roasted nuts to the top. Yum. Thank you Gillian. I often add a touch to my soup, I found them more attractive then.